Oahu is home to some truly amazing hiking trails, each with their own unique views and features. Just be sure to bring your camera with you because the scenery is breathtaking and makes the perfect backdrop for any photo! To help you make the most of your trip, here are 5 of the best Oahu hikes that you won’t want to miss. 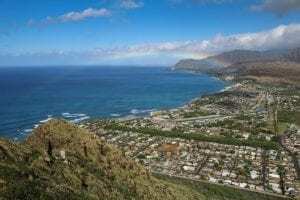 The Diamond Head Summit Trail is one of the best Oahu hikes and one of the most popular as well. This 2.9-kilometer trail is rated moderate in difficulty and is doable for most skill levels. Although many visitors simply hike this trail, it’s also great for trail running and off-road driving. It starts from the middle of the Diamond Head volcanic crater and travels to the top of the rim where you’ll find panoramic views of the island. As one of the shortest hikes in Oahu, this 2.6-kilometer out and back trail is great for nearly all skill levels. The Pu’u O Hulu Trail is accessible all year round and is primarily used for hiking, nature trips, and bird watching. Dogs are also allowed on this trail, so go ahead let your furry friends join in on the fun! Puu O Hulu is a small ridge and the trail will lead you to the top of it where you’ll find numerous pillboxes. The one that stands out the most is hot pink, and many people choose to climb on top of it to get pictures with the island scenery as the backdrop. The Makapu’u Point Lighthouse Lookout Trail is a 4-kilometer trail that runs along sea cliffs to an observation deck and lighthouse with fantastic views. There’s a parking area that offers access to the trailhead, which is completely paved. It’s considered to be easy in difficulty, so it’s a great hike to bring the whole family on. There are also multiple lookouts that offer panoramic views and the opportunity to see whales in the ocean. 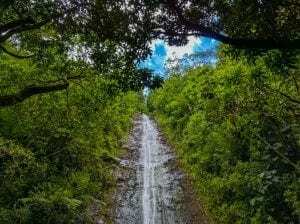 The Manoa Falls Trail is about 2 and a half kilometers long and is considered easy in difficulty. The trailhead can be accessed at the end of Manoa Road where you’ll have to pay to park. On your way to the waterfall, you’ll travel through the same tropical rainforest where movie scenes from Jurassic Park and LOST were filmed. The trail can be kind of muddy but the views once you reach the waterfall are worth every step! The Kuliouou Ridge Trail is a 6.4-kilometer out and back trail that is great for a moderate hike or a challenging run. It rises almost 1,800 feet before peaking on the spine of the Ko`olau Ridge and offers both scenic views and a variety of wildflowers. This trail is also dog-friendly so feel free to bring your pet along to share the experience with you! These are some of the best Oahu hikes and you’re guaranteed to have an amazing time on any one of them. If you’d like to enjoy the beauty of Oahu without hiking through it, you can always stop by CLIMB Works for our ziplining tour. Book your adventure today and start looking forward to the experience of a lifetime!